September 17 is designated Constitution Day in recognition of the anniversary of the signing of the Constitution. How many of these quiz questions can you answer? Q: Has the Constitution always guided the country? A: No, originally the nation functioned under the Continental Congress and the Articles of Confederation. But after 11 years under the Articles, the U.S. Constitution was written, agreed to, and ratified by nine states (all eventually ratified but only nine were needed to have it take effect). 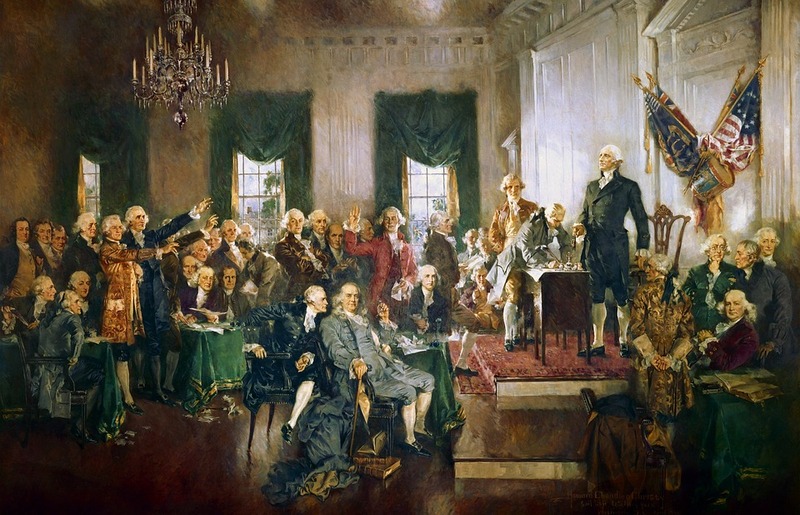 On September 13, 1788, the Continental Congress proclaimed that the Constitution had been properly ratified and it ordered the new government to convene on March 4, 1789. Q: Does the Constitution allow the Supreme Court to make law? Q: Does the Constitution allow the President to make law? Q: Does the Constitution give the federal government any power in the field of education? Q: Where in the Constitution is there authorization for foreign aid? Q: What are the three branches of government named in the Constitution? A: Legislative, Executive and Judicial. Q: Does the Constitution require a minimum age requirement for a Senator? Q: What are the Constitutional requirements for a person to be President? A: A President must be a natural born citizen (not an immigrant who became a citizen), must be 35 years of age, and must have lived in the U.S. at least 14 years. Q: Did the Constitution give the federal government power to create a bank? A: No. It was given power to “coin money,” meaning the power to establish a mint where precious metal could be shaped into coinage of a fixed size, weight and purity. Q: Can treaty law supersede the Constitution? Q: Does the Constitution allow a President alone to take the nation to war? A: Absolutely not. The Constitution states very clearly that only Congress has power to take the nation into war. Q: Are there any specific crimes mentioned in the Constitution? Q: Are the Bill of Rights considered part of the original Constitution? Q: According to the Constitution, how can a President and other national officials be removed from office? Q: What authority does the Constitution give the Vice President? Q: How many amendments to the Constitution are there? A: There are 27. The first ten can be considered part of the original Constitution. And Amendment 18 was repealed by Amendment 21, which means that in 220 years, there have been only 15 amendments. Amending the Constitution is a difficult process, made so by the Founders to keep anything silly or dangerous from being added in the heat of passion. Q: Does the Constitution say anything about illegal immigration? A: Not directly. But Article IV, Section 4 assigns to the federal government the duty to “protect each of them [the states] against invasion.” Note that it does not stipulate that an invasion be done militarily. Q: Does the Constitution tell us how new states are added to the union? Q: How is an amendment to the Constitution added? Q: Is the term of a President limited by the Constitution? A: Yes. In 1951, the Constitution was amended (Amendment 22) to limit anyone to two terms as President. The only President who served longer was Franklin Delano Roosevelt who served into a fourth term, but died in April 1945 shortly after the beginning his 13th year in office. A: Article I, Section 7 states: “All bills for raising revenue shall originate in the House of Representatives…” If a majority in the House (218 is a majority of its 435 members) refuses to originate a bill to raise revenue for any purpose, no funds can be raised, until it passes. Q: How does the Constitution explain expelling an elected member of the House or Senate? Q: What does the Constitution say about financing a military arm? A: Article I, Section 8 says that the Congress can raise an army but “no appropriation of money” to fund it shall be for longer than two years. The same Article says Congress can provide for a navy without that same restriction regarding funding. Why? The men who wrote the Constitution feared the possibility that a standing army housed within the territory of the nation might arise and seek to take power. But they did not fear that a navy would try to do that because a navy and its weaponry did not reside within the nation, only at sea or coastal seaports. Q: How many times is the word democracy mentioned in the Constitution? How did you do? For a refresher, read the Constitution and watch Overview of America. (Image from Max Pixel, CC0 Public Domain). Previously having discussed the fundamental properties which different systems of government are based on, today’s topic will primarily be concerned with the potential of The John Birch Society for preserving our republic. The John Birch Society (JBS) is dedicated to restoring and preserving freedom in The United States of America by inspiring Americans to work for less government, more responsibility, and – with God’s help – a better world. This nationally recognized organization was founded during a two-day meeting in Indianapolis, Indiana. During that meeting in December of 1958, Robert Welch proposed a plan to counteract the rising attempts of economic and political control over our country. The organization’s foundation can be thoroughly studied by reading The Blue Book of the JBS. Throughout this book, Robert Welch formulates a brilliant course of action, breaking it down step by step, in order to protect our nation. Within The Blue Book, you will find ten steps proposing the procedure of exposing the truth through extending the message. These steps vary in activity. One step consists of publishing a magazine with the idea to help keep conservative periodicals in circulation and offering the people an actual source of news articles; while another is promoting the JBS through the radio and extending our message with the use of technology. In an attempt to widen the audience, The John Birch Society would not only offer its staff to be guests on radio shows, but also provide speaking tours throughout the country, focusing predominately on current affairs and educating audiences on constitutional solutions. The John Birch Society would also have numerous campaigns and action alerts offering activists an energizing way of exposing the truth. Robert Welch saw the successes other groups had with front groups. As a result, he set up ad hoc committees in order to be more effective in spreading the message. Letter –writing campaigns were seen as a resourceful way to contact legislators and would become an important tool. 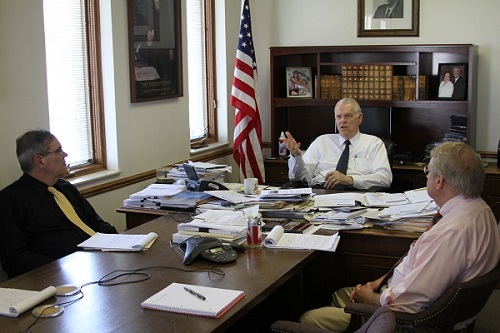 With field staff inspiring volunteers to be constantly contacting legislators and opinion molders, the officials would constantly be reminded of the problem at hand. Other steps would include developing connections internationally to not only expose the corruption within the U.S., but to also see that the corruption does not expand globally. This would include exposing corrupt politicians in the U.S., thus awakening the American people as well as insuring their various civil responsibilities. While the information written above does not even begin to reveal the depths of our organization, those ten steps written in The Blue Book are without a doubt the foundation from which we proudly function. For over 50 years, The John Birch Society has steadily upheld its mission and philosophies. Without any patience for corruption, our organization has remained true to its intentions. The headquarters in Appleton, Wisconsin stands as a wonderful think tank for the many publications and ideas the organization continues to produce. Whether meetings are held for developing campaigns, legislative action alerts are being researched and written, the many news articles for The New American magazine are being edited and posted, or support materials are being developed for field staff and membership, the passion each staff member has for the cause of freedom is evident from the high quality of the work being produced, as we work for less government, more responsibility, and – with God’s help- a better world. 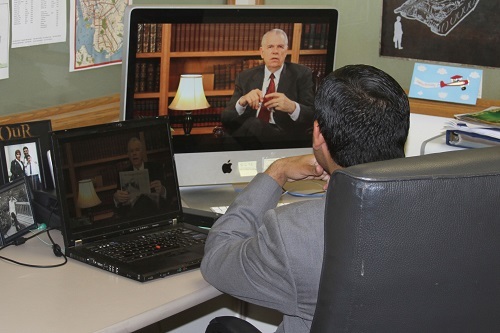 Research assistant Christian Gomez reviewing one of Art Thompson’s weekly videos. 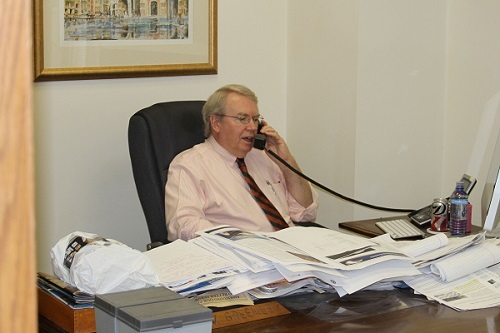 Larry Greenley, Director of Missions, on the phone discussing an action alert. If you’re concerned about the future of America and preserving what our founders gave to us, can we count on your help?